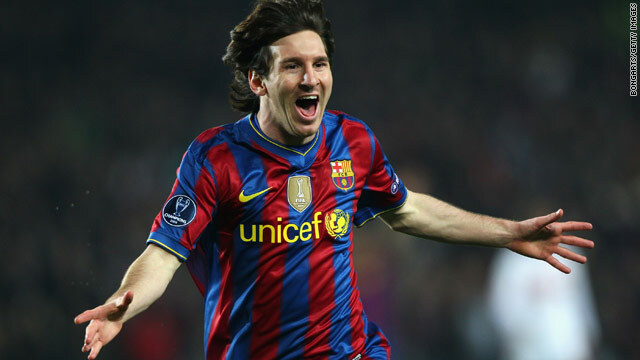 Barcelona's talisman Lionel Messi took his season's tally to 31 goals with a brace against Stuttgart. (CNN) -- Lionel Messi underlined his status as the best player in the world with two inspirational goals and an assist as holders Barcelona cruised into the quarterfinals of the Champions League with a 4-0 victory at home to Stuttgart on Wednesday night. While Cristiano Ronaldo, the world's most expensive player, was unable to stop Spanish rivals Real Madrid crashing out of Europe's premier club competition last week, Messi made sure that Barcelona suffered no such embarrassment ahead of Friday's last-eight draw. The Spanish champions will join Inter Milan, CSKA Moscow, Lyon, Manchester United, Bayern Munich and Arsenal in the hat along with Wednesday's fellow victors Bordeaux. The Argentina forward scored the opening goal in the 13th minute to give the Catalan giants a 2-1 lead on aggregate, then helped set up Pedro Rodriguez nine minutes later before killing off the German visitors with an opportunist third on the hour. Barcelona coach Pep Guardiola opted to start with Thierry Henry up front alongside Messi, leaving expensive pre-season signing Zlatan Ibrahimovic -- who scored the equalizer in Stuttgart last month -- on the bench. Influential midfielder Xavi was ruled out by an injury suffered in training on Tuesday. The hosts started with a fluidity sometimes missing in their European play this season, and Messi made Stuttgart pay for giving him too much space as he took the ball from near halfway and lashed in a left-foot shot from just outside the penalty area for his 30th goal of the season. Messi, who netted a hat-trick against Valencia on Sunday, then set Yaya Toure free in the penalty box with a delightful angled ball behind the Stuttgart defense, and the Ivory Coast midfielder's low cross gave young winger Pedro a simple chance to sidefoot into the net. Messi teed up Toure 10 minutes after halftime, but his resulting shot was dragged wide of Jens Lehmann's goal. The 22-year-old showed him how to do it five minutes later as he took a clever flick from Daniel Alves, turned his man and then placed a low shot into the left-hand corner of Lehmann's net. Ibrahimovic came on for injured midfielder Sergio Busquets in the 65th minute, and soon after Messi was denied his hat-trick by the veteran Lehmann. The former Germany international belied his 40 years as he got down to his left to keep out Messi's header from a towering Alves cross. Messi went close again in the 86th minute as he skipped through the Barcelona defense and dinked a chip past Lehmann, but wide of the goal. But Lehmann could do nothing to stop substitute Bojan Krkic slotting in Barcelona's fourth goal three minutes later as the 19-year-old ran onto Ibrahimovic's well-timed pass. French champions Bordeaux also progressed into the last eight with a 2-1 victory at home to nine-man Olympiakos, beating the Greek side 3-1 on aggregate despite also having a man sent off. Yoann Gourcuff put Bordeaux ahead in the fifth minute with a fine free-kick, and also hit the post with another set-piece. Olympiakos had striker Matt Derbyshire sent off for a second booking on the hour mark, but equalized on the night five minutes later through substitute Kostas Mitroglou. Bordeaux were also reduced to 10 men in the 69th minute when captain Alou Diara was booked for the second time after a seemingly innocuous challenge on Ieroklis Stoltidis. Striker Marouane Chamakh sealed the tie with two minutes to go when he powerfully headed in a left-wing cross from Benoit Tremoulinas at the far post, then Olympiakos saw Swedish defender Olof Mellberg dismissed for a second booking five minutes into time added on.